In the Victorian era, with the expansion of The Empire and the annexation of many India states, several of the Indian aristocracy found themselves to be deposed - and some of them travelled to England where they were made welcome by the Queen who indulged and entertained them. 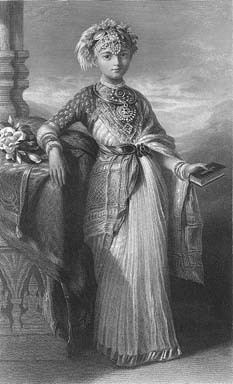 Princess Gowramma was the favourite daughter of Chikka Veerarajendra, the last king of Coorg. 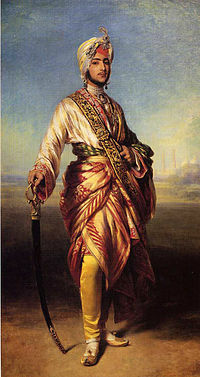 He was exiled to Benares after being dethroned by the British in 1834. 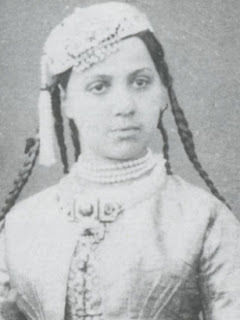 There, in 1841, the Princess Gowramma was born. However, by the time of her death, as early as 1864, she was living in England, and there she remains, in London's Brompton Cemetery. 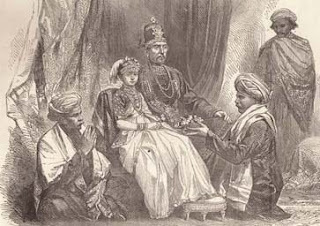 In 1852, Gowramma and her father were the very first Indian royals to travel to England - permitted to do so on the grounds that Gowramma's father, the raja, wished his daughter to be raised as a Christian, and to have a Western education. 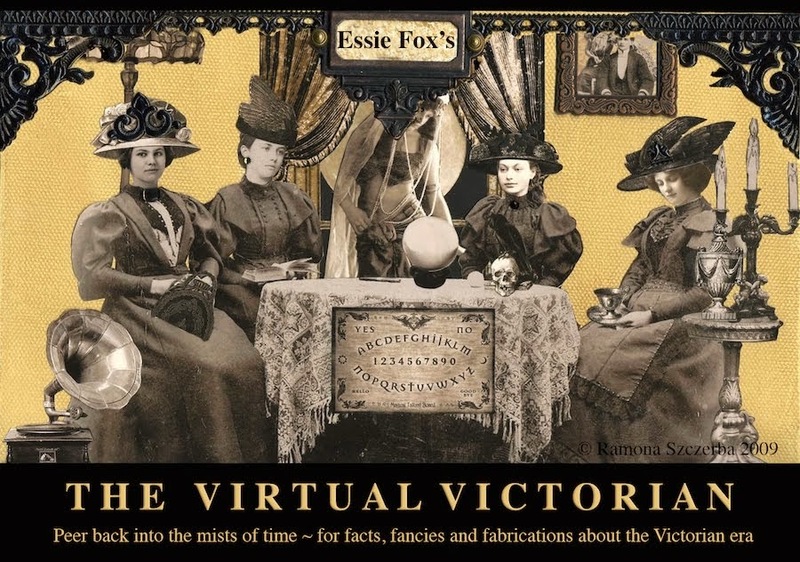 The princess was eleven years old when presented to Queen Victoria, who immediately grew very fond of the girl, not only encouraging her baptism but also becoming her godmother and endowing the girl with her own name - Victoria Gowramma. Gowramma was invited to Osborne House to share the Queen's family holidays. Victoria also commissioned a marble bust to be sculpted by Baron Carlo Marochetti, which was painted to show the princess's face as if a life-like image. 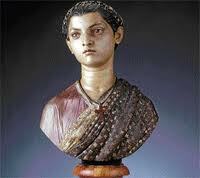 But Gowramma was not the only Indian royal to become a firm favourite with the Queen. 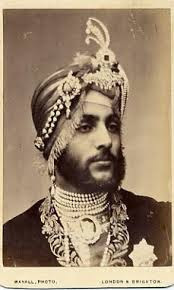 Another very frequent guest at all the royal palaces was the glamorous Duleep Singh, the deposed Maharajah of Punjab - who Victoria called her 'beautiful boy'. With both of the young Indians having converted to Christianity, and with any offspring they might then produce most likely to be Christians themselves, Victoria saw it as her mission to join the pair in matrimony - hoping that this might be the start of the spreading of the Christian faith throughout the whole of the India. However, there is a saying that man may plan but God unplans. End even the plans of a Queen may fail when it comes to matters of matchmaking. 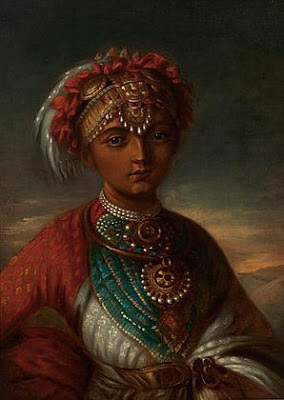 Whether or not Gowramma was attracted to Duleep (she was known to be an atrocious flirt, even making eyes at the Prince of Wales, and then discovered in an affair with one of her guardian's stable boys) the handsome young prince could not be convinced to wed his fellow Indian. Ironically, it is said that Duleep himself encouraged a relationship between Gowramma and the fifty year old Col. John Campbell; a handsome, blue-eyed gentleman who had served in the army in India. But, sadly for Gowramma, Campbell was a notorious gambler who only desired her for her wealth. When her father lost a legal case brought against the East India Company, in which he had hoped to claim interest on what had once been his national wealth, Campbell began to neglect the wife who was no longer quite as rich as her gold-digging husband had presumed. Gowramma had a daughter, Edith Victoria Gowramma who was barely more than a toddler when her mother died of tuberculosis - though rumour was rife at the time of her death that the cause had not been natural.The princess was twenty-three years old, and in the days following her death the Coorg crown jewels (then in her possession) mysteriously disappeared - as did her husband. As to Duleep Singh, his wife was met in Cairo when he travelled back to India, on a journey to scatter his mother's remains in the country of her birth. Bamba was the illegitimate daughter of a German merchant banker and his mistress of Abyssinian descent. 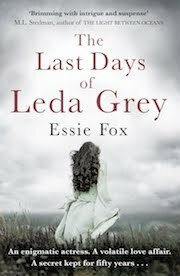 She was raised in a Christian mission school and succeeded in so beguiling Duleep that he brought her back to England where the newly-wed couple made their home at Elvedon Hall in Suffolk. Whatever she thought in private, Queen Victoria continued to welcome Duleep into her home and family, even going so far as to host the Christening of Duleep's son. The child was brought to Windsor and baptized in the Queen's private chapel, with Victoria acting as godmother for Prince Victor. Duleep Singh features in the VV's gothic Victorian novel, The Goddess and the Thief. very good and detailed narration of princess gauramma with pictures. thanks for sharing. sir these are my Maharajas of India vintage postcards in my collection which i am sharing in my Heritage of India blog. sir recently i am sharing these maharajas of india vintage postcards with school children at the time of i gave my seminar to them on indian heritage and culture. sir did you have any indian vintage postcards or prints etc. for my collection purpose and for sharing them in my blog. Great post. It sounds like the makings of a historical fiction novel or a historical romance.